Discussion in 'MapleStory 2 Global & Europe Hacks, Cheats & Bots' started by cosmorules, Nov 3, 2018. Value Editor - Run speed, attack speed, jump height. (Max values that I have set for these is the max I can make it without it being buggy.) Attack speed works best with Wizard and Assassin. Some classes it doesn't work at all. 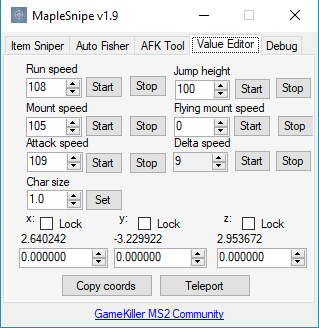 With the "All manual" feature you can now use the market sniper at any resolution. Market Sniper - Watches the first slot of the page you're on of the black market and buys the item when it appears at the specified price. If you enter your price as 55000, it will buy the item at 55k and below. Auto Fisher - Fishes for you, completes the mini-game as well. -The fishing minigame no longer uses pixel detection so it can be used at any resolution but I need feedback on whether or not it fails ever, if it does, use 1.8 for now. Trollerton, BadSanta1337, aouki and 101 others like this. Approved, thanks for your contribution! Magitek and cosmorules like this. Yeah right now unfortunately. I could hard code another resolution as a short fix for you if you want but my ultimate goal is for it to be completely responsive. ill try this out and give feedback. do u need the game client open at all times in order to use the auto fisher? I would assume so because he stated that he uses pixel detection for the game states. I'll add 1280x768 either tonight or tomorrow morning. Yeah you need it open, the auto fisher has to read the pixels from your screen to work. Is fishing a viable way to make mesos? limon123 and cosmorules like this. Is it also possible to add auto key spammer for certain keys? I'd like for the tool to insert "space and e", for auto furnishing (prestige exp). Auto remove+place thh same furniture over and over again.